All information about current visitors of your website is available on Visitors tab in the Operator Console. ISP, Current Page and Referrer columns are clickable and contain links to the ISP website, the page your visitor is browsing now and the referrer URL accordingly. 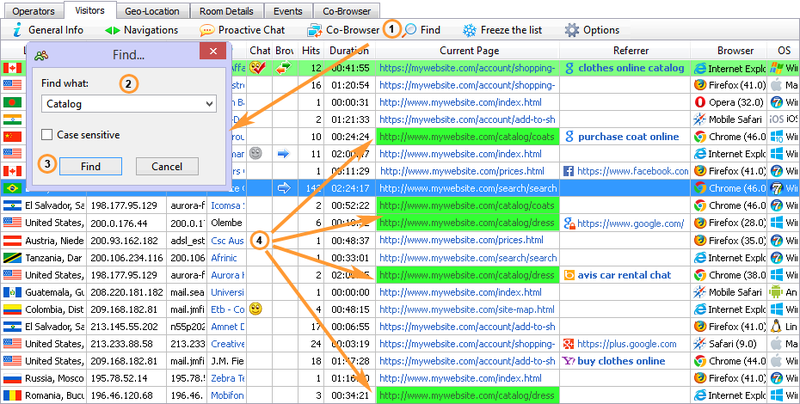 1.Visitor with an active chat session with you is highlighted with green in the list and marked with icon in Chat Status column. You can send messages to this visitor, current chat history is displayed in the console. 2.Visitor with open but not active chat session with you is marked with icon in Chat Status column.You need to switch to this visitor's chat tab to make the chat session active and send messages to this visitor. 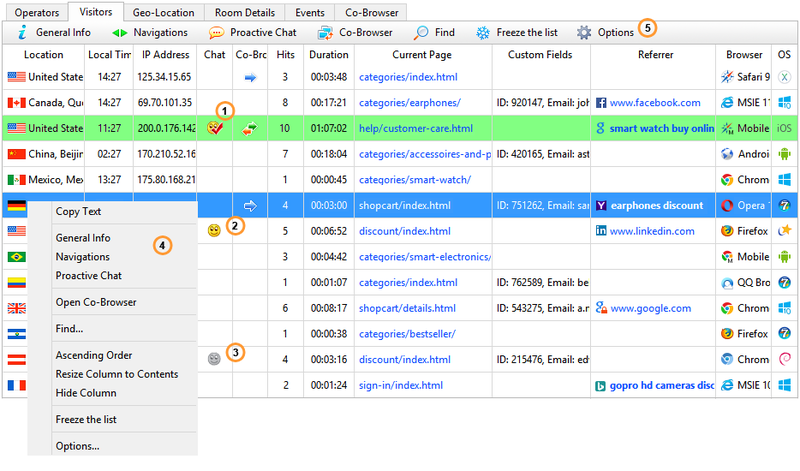 3.Visitor with open chat session with some other operator is marked with icon in Chat Status column. You cannot send a chat invitation to this visitor. 4.Visitor's context menu is opened by right click (Ctrl+click on Mac) on the visitor. Using this menu you can invite a visitor to chat (Proactive Chat), open extended visitor details (General Info), open visitor navigation history (Navigations), start co-browsing (Open Co-Browser), perform search through the list (Find...), copy text from the chosen cell (Copy Text), freeze the list and stop its "jumping" when new visitors arrive (Freeze the list), manage the chosen column appearance and open Visitors list options (Options...). 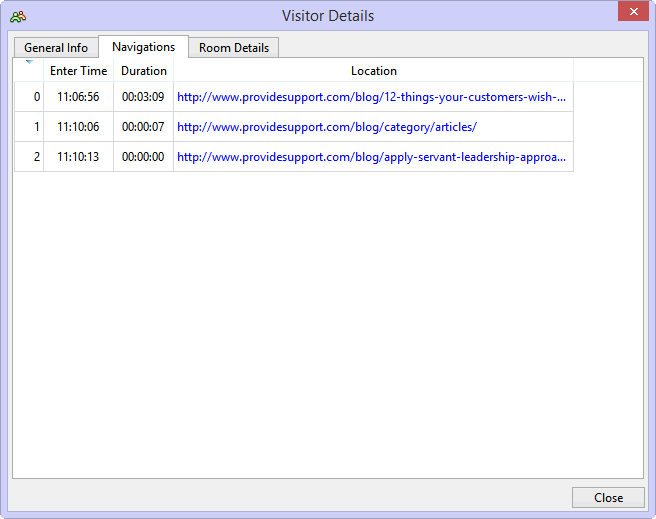 5.Visitor's tool bar is located above Visitors list. Using the tool bar you can open the selected visitor's details and navigation history, invite this visitor to chat, start co-browsing session, perform a search within Visitors list, freeze the visitors list and open Visitors list options. 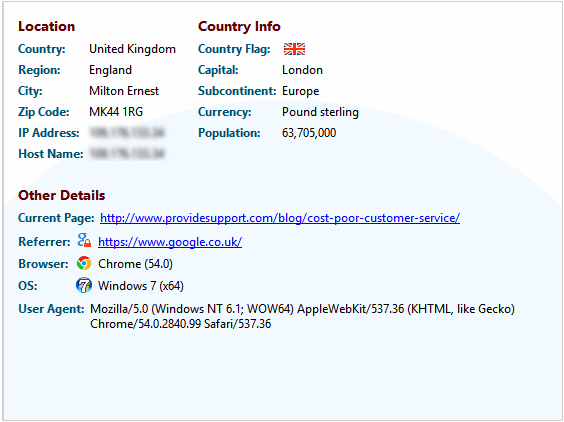 On mouse over it is possible to take a glance at General Information and at the Current page URL together with five recent pages. Extended visitor details are displayed in a separate window. You can open this window via the visitor context menu in Visitors list or by double click on visitor in the Visitors list. 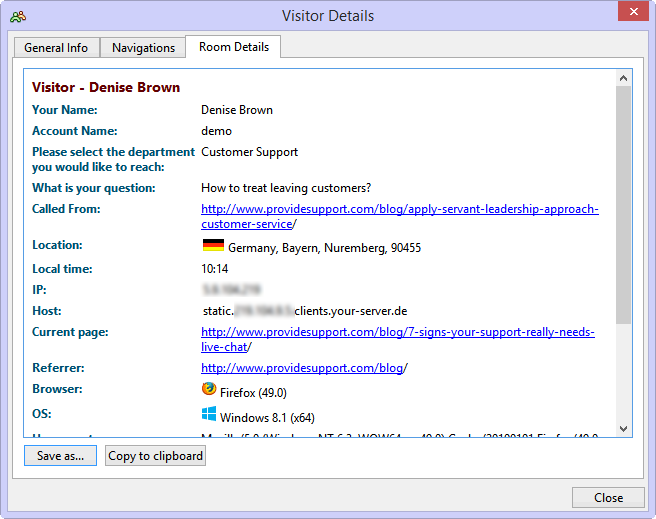 The first tab in Visitor Details window contains general information about the visitor. Most of this information is available in Visitors list, additional information contains visitor's country details. This tab can be opened directly from Visitors list toolbar. 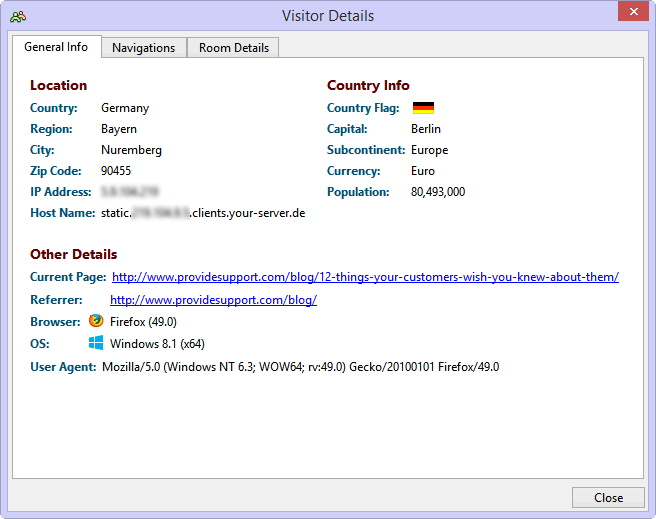 The second tab in Visitor Details window contains the visitor navigation history. Visited pages are numbered. The first visited page number is 1, the second - 2, etc. The most recently visited page is displayed at the top of the list. Navigation history list can be sorted by any column. 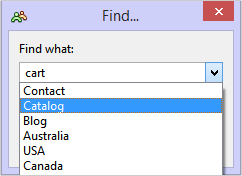 You need to click the column header for this and an arrow in the header will display the sorting direction. The third tab contains Room Details information about the visitor. This information is also available in the Room Details tab of the operator console. You can save or copy to clipboard the information appearing in the Room Details section. 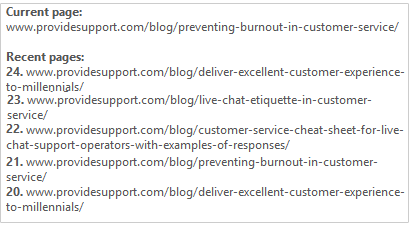 Visitors list appearance can be changed by hiding, resizing, rearranging columns and sorting visitors. You can show/hide the whole column or (for certain columns) the text and the icon. This can be done in the profile settings, Visitors tab. You can also hide a column using Visitors list context menu, Hide Column item. 2.Click the column header with left mouse button. A triangle will appear in the right part of the column header. triangle means ascending sorting, triangle means descending sorting. There is a possibility to perform a text search in Visitors list. Note! Text entered in Find... dialog is considered as a phrase, not separate words. 2.Visitors who have already left the website. These visitors will be highlighted with grey.